This page is a limited attempt to set out something on the dress and equipage, generally and by regiment, of the five regiments of Local Militia formed in Derbyshire in 1808, all of whose commanding officers’ commissions were dated 24 September of that year. It is very much a beginning, more a skeleton to be developed than a substantial treatment, but hopefully it will be of some interest to someone. Reference is made throughout to Howard Ripley and Bob Moodie, Local Militia Buttons, 1994 & 2002. The clothing of the Local Militia is to be the same in every respect as that worn by the regular militia of the county. As a Second Militia had been disbanded in 1805 the pattern was that of the single remaining regiment of “regular” Derbyshire Militia, with yellow facings, buttons in pairs, and silver metal for officers. 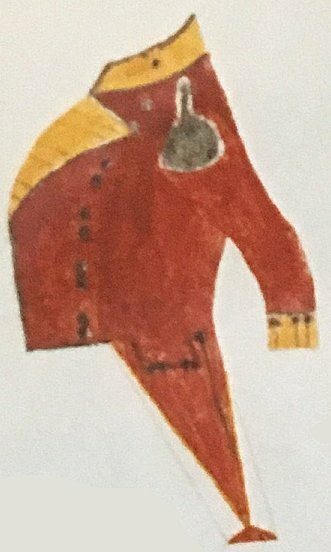 A rudimentary coloured drawing in the copy of the Hawkes tailor’s book at the National Army Museum (thanks to Ben Townsend for the image) shows an officer’s coat of this period for the Derbyshire Militia. It has a collar, lapels and cuffs of yellow, with ten buttons on the front in pairs, two pairs on each cuff and pointed cross pocket flap, two buttons at the rear waist, and a button (whether small or large is not clear) at each side of the collar. Yellow twist button holes are clearly shown on collar, lapels and cuffs; buttons and epaulette are in silver. (Though the reproduction is hazy, it’s possible that silver – or white? – edging is meant to be shown on the collar, lapels and front coat edge, sides and lower edges of the pocket flap, and down the pleats – unless this is just outlining.) The turnbacks appear to be narrowly edged in yellow, though no turnback ornament is shown. The later jacket version is shown in several miniatures of company officers by Frederick Buck. The yellow of the collar seems variable in shade but in two cases appears relatively pale; the front jacket edge is shown narrowly lined in white, but not the collar. As the Belper jacket (below) shows, the officers of the Local Militia seem to have followed this pattern closely. For the dress of the other ranks of the “regular” Militia, we have notes in the Pearse clothier’s book at the Canadian War Museum. These prescribe a jacket with ten small buttons in pairs, the looping lace “double headed”, meaning square ended. The shoulder strap buttons are small, while the large size is used for the two pairs of buttons on each cuff and pocket flap, with two buttons at the rear waist: altogether, 18 large and 12 small. A sample of the looping lace has a fairly broad yellow line at one side, a dark blue at the other, with instructions for the “Yellow edge in”, meaning on the inside of the loop. This jacket would have been worn by the men of the Local Militia regiments. Lieut Col Comm Joseph Strutt, Lieut Col Comm John Cressy Hall. The National Army Museum holds the jacket of Major, later Lieut Col, John Cressy Hall. This has a yellow collar, cuffs and lapels, now apparently a little faded. The lapels have two rows of ten large buttons in pairs, with two pairs with yellow twist button holes on each cuff, two pairs with scarlet twist holes on each slash pocket flap, and two buttons at the rear waist. At each side of the collar is a small button and twist button hole, but there are no such holes on the lapels. The front edge of the jacket is narrowly edged in white, as are the sides and pointed edges of the flaps, the rear opening and the pleats; the collar, cuffs and turnbacks are not edged. The turnback points are ornamented with silver lace trefoils on yellow cloth patches. This jacket is a good match for those of the “regular” Derbyshire Militia, as discussed above. The buttons are silvered, convex, diameters 14 mm and (probably) 20 mm; the recessed design shows a crowned shield with a border bearing a twelve petalled rose between “Belper Regiment” and “Derbyshire” in serifed capitals. The centre of the rose is added in relief as a small stud. A second type is shown in a drawing by Ripley and Moodie, silvered, 20 mm, inscribed “Belper / Local Militia”. Field Officers will wear white Leather Breeches Boots & Chain Spurs at both morning drills. At Dinner and Parade in the evening white kerseymere or leather pantaloons and half Boots with spurs screwed to them. Black waist belts except on field days when the white regulation Shoulder Belt is to be worn. Black Silk or velvet Stocks or handkerchief tied behind. To wear the knots of their Sashes on the Right Side. Officers to wear white kerseymere waistcoats, Breeches, Long Black Cloth Gaiters with the Regimental Button at Morning Exercise, Black Silk or Velvet Stocks or handkerchiefs tied behind. At Dinner and Evening parade, Hessian Boots & White Pantaloons may be worn. Powder to be worn at all time, to wear the knots of their Sashes on the Left Side. 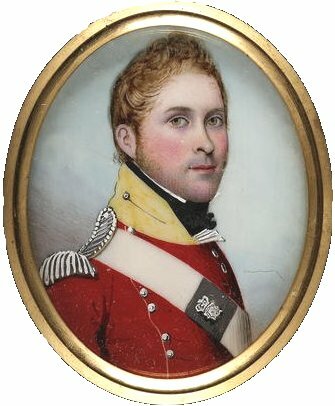 A reference is made in May 1809 to flank company officers’ “hats or caps”; the latter may refer only to the fur caps of the grenadier company (see below). Gorgets were to be worn in the field but removed on dismissal; only officers on guard were to wear gorgets at dinner. For the ranks, in 1809 the red jackets with breeches and long gaiters were worn for evening parades, generally with the bayonet belt (“side arms only”), but from 1810 with both belts and with arms, and on occasions with knapsacks. A “white drill dress” was generally worn for morning and noon exercises, consisting of the white waistcoat (presumably sleeved) and white trousers (presumably of duck); forage caps were also in use. The Grenadiers will be Directed to put each man his name in his Cap tonight & make it Quite fast. That Company will Parade ¼ of an hour before the Others tomorrow Morning with their forage Caps on & their Caps in their hands & will be marched to the store room to deliver them there to have their white bands & tassels fastened on. At the first training in May 1809 one man per company was selected to be a pioneer, and issued with a fur cap and “appointments” (axe, axe case and strap, apron). In June 1810 the pioneers were ordered to have their muskets in the field, and to parade at the head of the regiment in pioneer uniform but without their appointments. 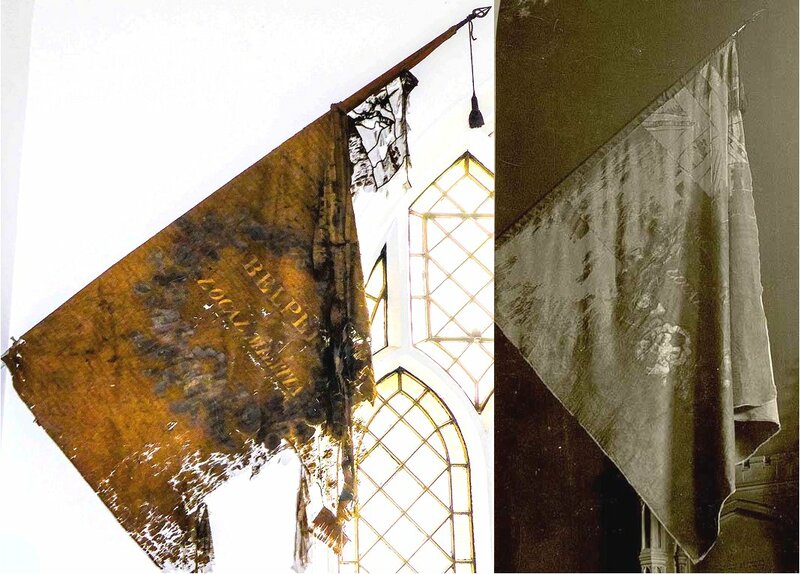 Remarkably, the regimental colour has been hanging in St Peter’s Church in Belper for two centuries, though it is now in a state of terminal decay. Images were posted on the “Belper and Proud” Facebook page in 2015, together with a photo of the colour from 1908. The field still has something of its original yellow colour; the title “BELPER / LOCAL MILITIA” is painted in gold within a Union wreath tied with a ribbon at the foot. Lieut Col Comm Henry (Harry) Bache Thornhill. Howard Ripley and Denis Darmanin illustrate a button, described simply as silver, in an MHS Bulletin. 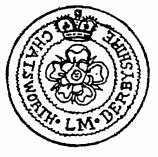 The design, inscribed “Chatsworth ● LM ● Derbyshire” in serifed capitals and enclosing a five petalled rose, appears the same as those of the Scarsdale and Wirksworth regiments. A number of images can be found online of what is said to be an officer’s cap plate used from 1803 for the Chatsworth Volunteer Infantry, which may (or may not) also have seen use with the successor regiment of Local Militia. 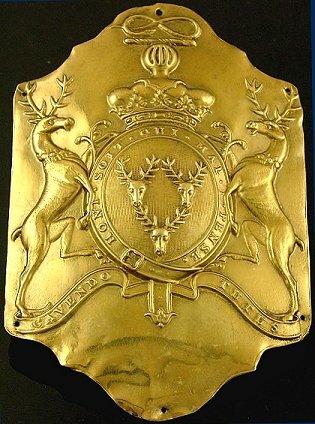 Of gilt copper, and measuring 15 x 10 cm, this shows the arms of the Duke of Devonshire, including the motto “Cavendo Tutus”, and the Garter motto (“Honi Soit …”). Officer’s buttons are silvered, convex, the recessed design showing a crowned shield with a border bearing a twelve petalled rose between “Derby” and “Local Militia” in serifed capitals. The centre of the rose is added in relief as a small stud. The example shown here is from the Gaunt Collection at Birmingham Museum. Diameters of the two sizes are 15 mm and 20 mm. Officer’s buttons are silvered, the design in relief showing a crowned simple garter with rope edges, inscribed “Scarsdale ● LM ● Derbyshire” in serifed capitals and enclosing a five petalled rose. The smaller size is of 14 mm diameter. Lieut Col Comm Francis Hurt (possibly Charles Hurt). Officer’s buttons are silvered, slightly convex, the recessed design showing crowned simple garter with rope edges, inscribed “Wirksworth ● LM ● Derbyshire” in serifed capitals and enclosing a five petalled rose. The larger size is recorded with a diameter of 20 mm. Officer’s belt plates were sold by Dix Noonan Webb in 2005 and 2013. 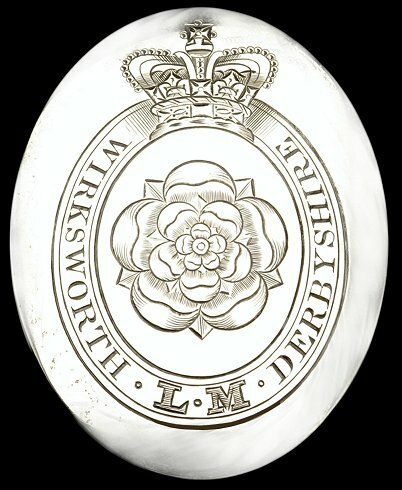 Both examples are oval, silver, the engraved design showing a crowned simple garter inscribed “Wirksworth ● LM ● Derbyshire” in serifed capitals and enclosing a five petalled rose. At the Sherwood Foresters Museum at Nottingham Castle is a fife case painted yellow, with the painted design of a crown, in gold and white with a red cap, over a blue garter with gold edges and lettering, inscribed “Wirksworth ● L ● M ● Derbyshire” in serifed capitals, enclosing a red five petalled rose, all the lower and right edges of the design shadowed in black. On the cap is painted a gold “7” for the 7th Company, shaded in black below and at right, within a laurel(?) wreath.